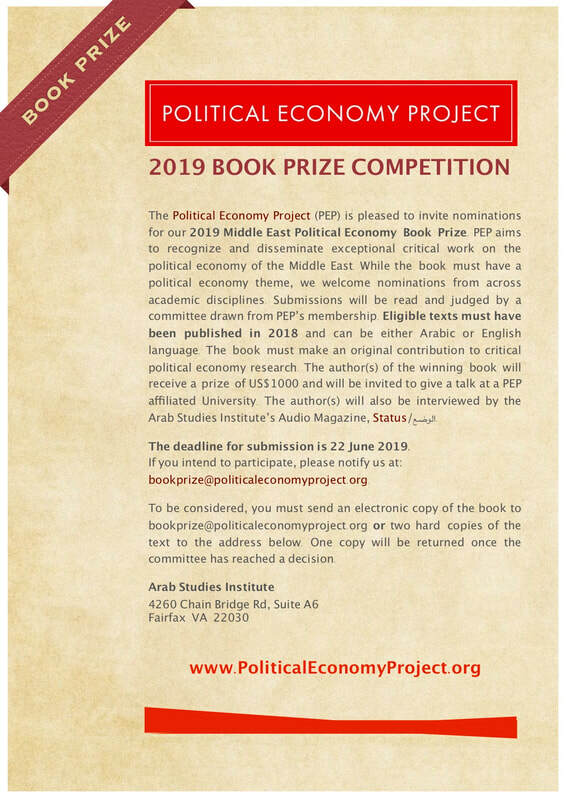 The Political Economy Project (PEP) is pleased to invite nominations for our 2019 Middle East Political Economy Book Prize. PEP aims to recognize and disseminate exceptional critical work on the political economy of the Middle East. While the book must have a political economy theme, we welcome nominations from across academic disciplines. Submissions will be read and judged by a committee drawn from PEP’s membership. Eligible texts must have been published in 2018 and can be either Arabic or English language. The book must make an original contribution to critical political economy research. The author(s) of the winning book will receive a prize of US$1000 and will be invited to give a talk at a PEP affiliated University. The author(s) will also be interviewed by the Arab Studies Institute’s Audio Magazine, Status/الوضع. The deadline for submission is 22 June 2019.